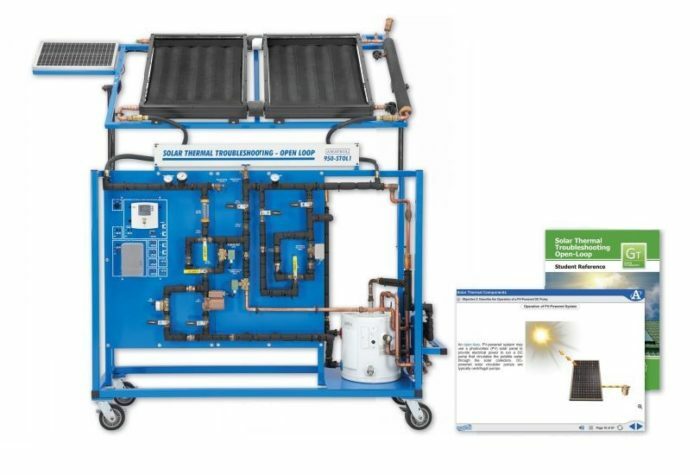 Amatrol’s Solar Thermal Troubleshooting — Open-Loop Learning System (950-STOL1) teaches learners how to connect, operate, program, and troubleshoot open-loop solar thermal systems. The combination of in-depth, multimedia curriculum with real-world equipment gives learners hands-on experience with both drainback and pressurized open-loop solar thermal systems. When paired with two required sun simulator systems, the open-loop solar thermal troubleshooting training system provides convenient solar thermal troubleshooting training indoors. In addition to building hands-on, job-ready solar thermal troubleshooting skills, the system also supports the North American Board of Certified Energy Practitioners (NABCEP) test for Certified Solar Thermal System Installer. Amatrol’s open-loop solar thermal troubleshooting training system features a wide variety of industry-standard components that provide learners with hands-on practice with real-world equipment. Components such as check valves, flow meters, relief valves, a vacation bypass, and tempering valves create a realistic learning environment that allows learners to troubleshoot both electrical and fluid faults as they study the installation and operation of open-loop solar thermal systems. The system also includes a digital differential controller, so that learners can learn how to program the modern solar thermal systems they’re likely to encounter on the job. Amatrol’s curriculum features a highly-interactive, multimedia format that includes stunning 3D graphics and videos, voiceovers of all text, and interactive quizzes and exercises designed to appeal to learners with different learning styles. The open-loop solar thermal troubleshooting training system curriculum teaches learners both basic and advanced concepts related to open-loop solar thermal systems. For example, learners will study how to connect, operate, and troubleshoot an open-loop solar thermal system, including common components like pumps, storage tanks, and different types of valves. The combination of theoretical knowledge and hands-on skills solidifies understanding and creates a strong basis for pursuing more advanced skills. Learning with the open-loop solar thermal troubleshooting training system doesn’t need to wait for good weather or a sunny day. To enable learners to study solar thermal troubleshooting concepts indoors, the system requires two related systems: a Solar Thermal Sun Simulator (95-STS1) and a Solar PV-Thermal Sun Simulator (95-STS2). With these systems shining on the solar collectors and PV panel, learners can use the system regardless of the weather outside! A sample copy of the Solar Thermal Troubleshooting — Open-Loop Student Reference Guide is also included with the system for your evaluation. Sourced from the system’s curriculum, the Student Reference Guide takes the entire series’ technical content contained in the learning objectives and combines them into one perfectly-bound book. Student Reference Guides supplement this course by providing a condensed, inexpensive reference tool that learners will find invaluable once they finish their training, making it the perfect course takeaway.